The Los Angeles Angels can’t seem to escape the injuries that continue to plague their pitching staff. The latest victim is closer Keynan Middleton. The Angels placed Middleton on the DL Monday after an MRI revealed damage to the ulnar collateral ligament in his elbow. Middleton will seek a second opinion. However, such an injury often leads to Tommy John surgery, which would rule out Middleton for the rest of the season. Middleton pitched Sunday against the Twins but was removed before he could complete a full inning. The last two pitches he threw were fastballs that clocked in at 88 and 92 mph. Middleton typically throws closer to 97 mph, indicating an obvious problem. It was his third outing since being activated on Thursday following a brief stint on the DL because of elbow inflammation. When healthy this season, Middleton has been the team’s most important relief pitcher. In 16 appearances this season, Middleton has an ERA of 2.04. More importantly, he was serving as the team’s primary closer prior to his first stint on the DL. His return to the DL leaves the Angels without a clear-cut pecking order in the backend of the bullpen. Jim Johnson has the most closing experience of anyone on the Los Angeles staff. He’s also had a good start to the season, posting a 3.32 ERA, after a rough season with the Braves last year. Blake Parker and Cam Bedrosian both spent time in the closer’s role for parts of last season with varying levels of success. Both have been reliable this season, but not at the same level as Middleton before his elbow problems. Thus far, lefty Jose Alvarez may be the team’s best reliever aside from Middleton. Alvarez has pitched to a 1.47 ERA, although he’s the only lefty in the Los Angeles bullpen. The Angels are also hopeful that Blake Wood can contribute out of the bullpen when he comes off the DL in the near future. At the moment, the Angels have one of the better bullpens in the American League. They clearly have some depth behind Middleton. That should give them a chance to cope if he’s lost for the season. Nevertheless, losing their closer is still a huge blow for the Angels. The team began Tuesday tied with the Astros atop the AL West. 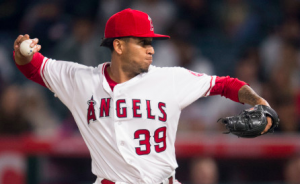 However, until Scioscia can re-organize the bullpen and find a full-time replacement for Middleton in the closer’s role, there will be reasons for the Angels to be concerned about their bullpen moving forward.